In the summer of 2017, director Christopher Nolan gave us his interpretation of one of the most intense early moments of World War II with his film Dunkirk. But what about the events in England leading up to that do or die situation? 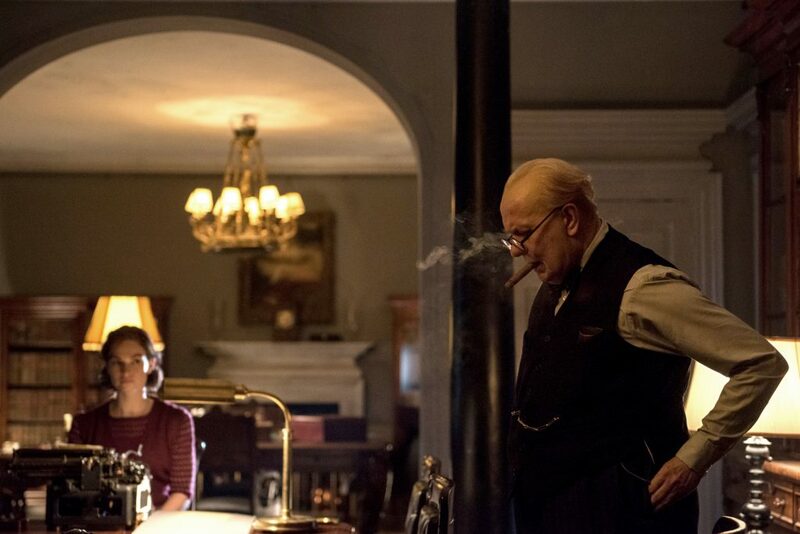 In Darkest Hour, director Joe Wright (The Soloist, Pan) and writer Anthony McCarten (The Theory of Everything) bring to life the story of how newly-appointed Prime Minister Winston Churchill (Gary Oldman) is placed into a position of either caving in to Adolf Hitler or fighting the good fight against almost impossible odds. As the film begins, it’s May 1940 and Germany is ready to invade Belgium and the Netherlands. The Nazis and Hitler on the move while the United States remains neutral and England is on the brink of political turmoil. Prime Minister Neville Chamberlain (Ronald Pickup) has lost the confidence of the Opposition in Parliament as they view him too weak to deal with the German threat. Chamberlain resigns in hopes that Lord Viscount Halifax (Stephan Dillane) will accept the recommendation. However, Halifax refuses, leaving no other choice but Winston Churchill, who is not a well-liked man, leaving many to question just how long he will last. Churchill’s first speech reiterates his previous stance that war with Germany is inevitable without even mentioning the prospect of peace. He doesn’t have time to settle into his new role as the crisis of Dunkirk arises, forcing Churchill to make some questionable decisions, much to the chagrin of Chamberlain and Halifax, both of whom are part of Churchill’s cabinet. With the threat of a vote of no confidence at home and the lives of most of the British Army at risk in Dunkirk, Churchill is on the brink of either failure or success as his own confidence begins to falter. Gary Oldman’s performance is amazing and I highly suspect he will be nominated for an Academy Award. Furthermore, it wouldn’t surprise me if he won the honor. Once or twice, I could recognize Oldman’s eyes but for much of the film, I was pulled into the moment as he pulls off an incredibly tough impersonation of a well-known historical figure. He is surrounded by an impressive supporting cast, especially Pickup as Chamberlain and Ben Mendelsohn as King George VI. Oldman and Mendelsohn have two great scenes together, highlighting their initial resistance towards each other and their eventual and mutual respect as England was on the brink of war. To help show the more human side of Churchill, a sub-plot revolves around Churchill and his secretary, Elizabeth Layton (Lily James). In real life, Layton had tremendous respect for Churchill, describing how difficult he was to work for while always being a loving and amusing man who loved his country with a passion. This is brought to life again through an amazing performance by Oldman and with support from James. 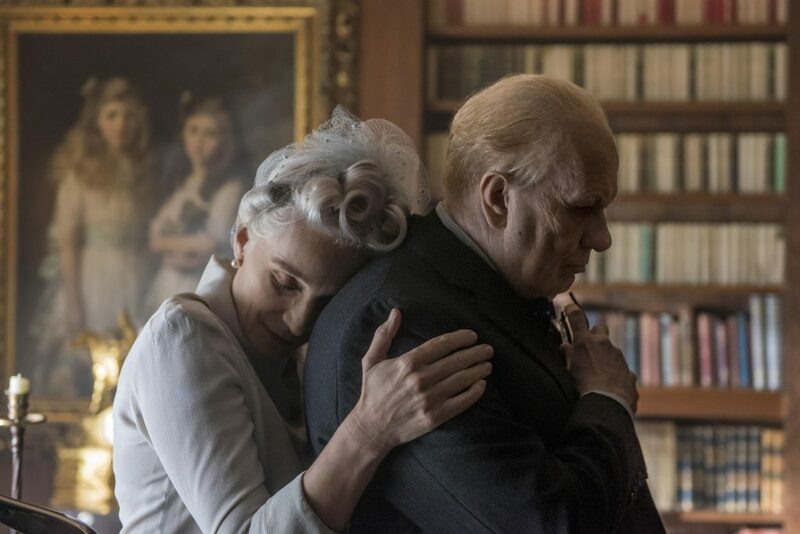 Darkest Hour tells the now-familiar tale of the dawn of Churchill’s reign as Prime Minister as well as the behind-the scenes machinations of Dunkirk and Operation Dynamo, the effort to use civilian ships to bring the boys back home. The film has a lack of vibrant colors, which accurately matches the overall tone of the moment. Wright succeeds in pulling the viewer into that moment, making you genuinely interested in the outcome despite the fact that the story played out decades ago and it well-known to many. While the topic may be dry to some it is truly a fascinating historical drama enhanced by a series of excellent performances. Darkest Hour is a story that relies on the power and presentation of the script and, on that note, it succeeds with high marks. The story of powerful leadership and inspiring a country are indeed very topical today. History often has a way of repeating itself, so the best way to prepare for the future is by becoming a student of the past. Darkest Hour is a great start and a film I highly recommend. Entertainment writer and film critic. Kansas City Cinephile, Monster Movie Kid blog, Dread Media podcast, The Basement Sublet of Horror magazine, 1/2 of The Classic Horrors Club podcast, and member of the Kansas City Film Critics Circle.